1. This past Friday afternoon, less than eight full days after trying – and failing – to destroy Wisconsin's Open Records laws, the very same Republican legislative leaders who perpetrated that assault, launched a second, completely unfounded attack on Wisconsin's non-partisan Government Accountability Board (GAB), the nation's only non-partisan state agency that oversees elections, campaign finance law, ethics and lobbying law, and a model that other states aspire to emulate. This latest attack is based on an opinion piece (not a news account) in The Wall Street Journal, which has long attacked Wisconsin's non-partisan GAB and our longstanding law that bars candidates for statewide and legislative office from coordinating campaign activities (including phony issue advocacy) with outside special interest groups. The editorial board of The Journal, together with Wisconsin Club for Growth (WCG), have taken this position because of the illegal coordination alleged to have occurred between WCG and Governor Scott Walker and his campaign during the 2011-2012 recall elections. Both entities were the subject of a bi-partisan, "John Doe" investigation by five Wisconsin county district attorneys and a Republican Special Prosecutor, which was halted by two judges last year and is now pending before the Wisconsin Supreme Court. The Wall Street Journal, Wisconsin Club for Growth and Walker adherents call it "free speech." It's anything but that and it is not constitutionally protected. Others, including CC/WI, believe it very well could be "illegal campaign activity" and "corruption." The GAB correctly and unanimously authorized the John Doe investigation into this matter in 2012 and The Wall Street Journal and the exteme right wing have been misleadingly screaming bloody murder and seeking retribution against the GAB ever since. For no legitimate reason whatsoever. This is their latest coordinated attack, timed to occur right before Scott Walker announces for the Presidency today in Waukesha. Obviously, it is intended to draw attention away from the role Walker and the Republican leaders played during last week's budget fiasco where they were called out for attempting to completely destroy Wisconsin's Open Records law. One of the leading proponents of eviscerating the Open Records law, State Representative Dean Knudson (R-Hudson) is also leading the attack (and writing the legislation) to destroy the non-partisan GAB and make it a partisan instrument under strict Republican control. Knudson, a North Dakota veterinarian, issued this release on Friday, together with Assembly Speaker Robin Vos (R-Rochester), hoping that your attention would be diverted from the key role both played in the open records destruction plot. It won't be. 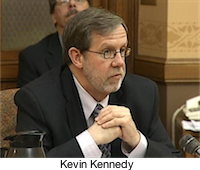 Also Friday, the two Chairs of the Joint Finance Committee who engineered the July 2nd open records-destroying vote in their committee, State Rep. John Nygren (R-Marinette) and State Senator Alberta Darling (R-River Hills), issued their own "bait and switch" release calling on long-time and nationally-respected GAB executive director Kevin Kennedy to resign based on the totally biased, unsubstantiated and highly speculative Wall Street Journal opinion piece. Perhaps they would have been a bit more circumspect had they been called upon to resign for their disgraceful and substantiated role in trying to undermine our open records law. But we didn't and they weren't. GAB executive director Kevin Kennedy issued a very appropriate response to the attack on the GAB and on him. Should there be an investigation into what transpired between former IRS official Lois Lerner and Kennedy? Sure. But it's another right-wing smokescreen. The so-called "IRS Scandal," in which Lerner and others were accused of targeting only conservative organizations for possible illegal tax activity, has proven to be just another largely bogus, unsubstantiated and highly partisan attack on the Obama Administration, much like the incessant partisan Benghazi hearings and other imagined plots. Make no mistake. 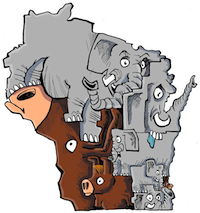 The Wall Street Journal editorial, and the Wisconsin GOP attacks on the GAB and Kennedy were timed right before the Walker announcement for the Presidency to help "clear the deck" of the ongoing, very "troublesome" John Doe investigation – as well as to pave the way to make illegal campaign coordination legal in Wisconsin, and to quickly change the subject away from the Open Records law fiasco. The Wisconsin State Journal laid it all out and nailed it in their Sunday editorial. CC/WI's Director responded to the surprise attack on the GAB and Kennedy on Friday. Obviously, there will be much more on all of this. And we will be on it. 2. Almost lost in all of the attention surrounding the state budget disaster and other outrages was some good news (beyond stopping, for now, the assault on the Open Records Law). On the heels of a recent and excellent U.S. Supreme Court decision on June 29th – which stipulated that citizens, not partisan legislators, have the ultimate power to determine state legislative and congressional boundaries following the Census every ten years – a federal lawsuit was launched last week in Madison aimed squarely at the extremely partisan, highly secretive and shockingly expensive (for taxpayers) 2011 redistricting process which resulted in only 10 percent of all state legislative general elections being even remotely competitive in 2014. Some legal experts believe this lawsuit could be decided favorably yet this year and the 2011 maps would be thrown out and ordered redrawn prior to the 2016 elections. This Milwaukee Journal Sentinel editorial makes a compelling case about why redistricting reform is so needed in Wisconsin, now. Jay Heck was on "The Devil's Advocates" radio program on Friday to discuss the implications of the lawsuit, the lack of competition in Wisconsin general elections, and why that's a huge problem. You can do something right now to help solve this problem. Sign our online petition TODAY urging the Wisconsin Legislature to support non-partisan redistricting reform. If you've already signed this petition, grab five friends or family members and have them sign this, too! 3. In late May, CC/WI got wind of a big Madison fundraising event being held by Wisconsin Joint Finance Committee Co-Chair, State Senator Alberta Darling (R-River Hills), with "special guest" JFC Co-Chair, State Representative John Nygren (R-Marinette), right when the JFC was still making important decisions about the then-unfinished state budget. We called on her to postpone the May 28th event. And, to Darling's credit, she responded affirmatively and postponed her event and another one in June. In June, we also called on State Senator Julie Lassa (D-Stevens Point) and Lassa, likewise, complied and postponed her event. The State Senate Democratic Committee likewise postponed an event they had scheduled for June 30th. 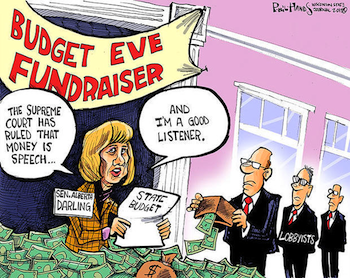 We were concerned about legislative fundraising events scheduled to occur before or on the statutory deadline for the legislature to complete their work on the state budget, which is June 30th. To that end we called on three other events at the very end of June to be postponed: a Milwaukee Assembly Democratic fundraiser, and events scheduled by State Representative John Maaco (R-Green Bay), and State Rep. Daniel Riemer (D-Milwaukee). All apparently thumbed their noses at us and held their campaign cash grabs anyway. To their discredit. Still, it was gratifying to force the postponement of a number of campaign cash grabs at a time when legislators should be solely focused on sound fiscal policy for the citizens of Wisconsin, and not on their own campaign accounts. Thanks to all of you who called and wrote legislators and expressed your opinions on this matter. We forced some change for the good for a change! Another Unwarranted Attack on Clean Government in WisconsinTweet this!